The first match of the day three is over and VP come back from 0-1 down to beat coL, eliminating them from the tournament. Virtus Pro come back from 0-1 down to beat Complexity Gaming in the second round of the lower bracket to secure themselves a top eight finish. They'll be facing the winner of Secret/Invictus Gaming in the next round. The dream run of Complexity finally ends but for what its worth, they played their hearts out this year and should be proud of this 9th-12th finish at the International 5. The Complexity did not have enough lockdown but had a great late game while Virtus.Pro were going to be good in the mid late game. coL got a zero minute first blood on the Razor and were ready to go. Even though coL had more kills at the start, VP had the advantage in terms of net worth. The Queen of Pain and Phoenix had an amazing start while the lane with IO and Gyrocopter didn't go well. QWOP and Phoenix combined to get a double kill on the top lane and were in a commanding position. At 11 minutes into the game, the Phoenix was having the game of his life; level 11, a midas and 70 last hits. Then VP moved to the middle lane to get the tower and got four kills thanks to the Song of the Siren into Phoenix Egg. 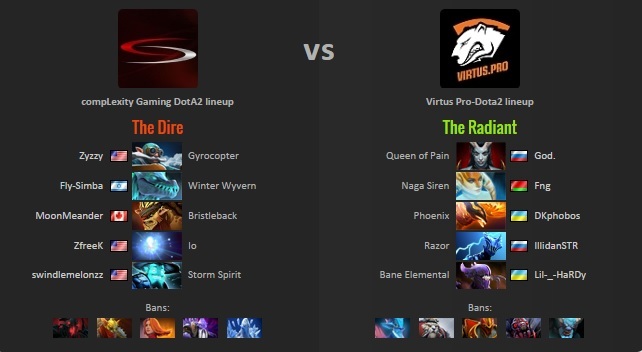 A similar fight took place again, this time near the radiant tier one and VP got four kills and were well ahead at this point in the game. coL grouped up and pushed the bottom tier one tower and surpisingly had an amazing fight, leading to four kills and the game is close to even. coL even geot Roshan but surprisingly give it to the Bristleback instead of the Storm Spirit or Gyrocopter. Complexity get over confident and die at the enemy tier two tower, God on his QWOP gets a triple kill and moves to the top of the net worth chart. At 30 minutes the score was 30-15 in favor of VP and the QWOP had Orchid, Hex and Aghanims while Phoenix had the Refresher Orb. Even though VP had gold advantage, coL got the perfect team fight and killed two. Since VP's heroes didn't have buybacks coL got a lane of barracks. Storm was back into the game at this point. The final push comes in at 48 minutes with coL going straight down mid lane. The Americans get the melee barracks and back but VP decide to chase, in the process they kill Gyro and Storm but suffer heavy losses. coL decide to buyback and just end the game, Phoenix respawns and gets two Eggs off but coL somehow manages to win the fight and wipe VP, forcing out the gg call. The second game featured a fifth pick Broodmother from Complexity and it looked like they had out drafted VP since they had both early and late game presence. The game started out with a LOT of rotations, there were like five lane swaps in the first 5-6 minutes. The game started with Lina and Naga bullying the Anti Mage and QWOP. Even though coL had a bad start they managed to get a couple of early kills and Broodmother takes over the Dire jungle and manages to come to the top of the net worth charts. The kill score was in coL's favor but like the last game VP manage to dominate the net worth chart. But thanks to the Brood and Chen army they start getting early towers and everyone except AM is doing well. Anti Mage had 15 last hits at 11 minutes while the Dark Seer was the highest net worth. coL take over the enemy jungle, shut down heroes and start to snowball. By 20 minutes, Anti Mage is somehow the top net worth, Brood gets a Desolator and coL is in full control. At this point the game gets stagnant because VP dodge fights and look for pickoffs. They get multiple kills on the AM and QWOP, picking coL apart and are still in the game. The comeback looks real, they also get an amazing initiation and get two kills but the Anti Mage comes out of nowhere and gets an ultra kill, consequently moves to 14k net worth. 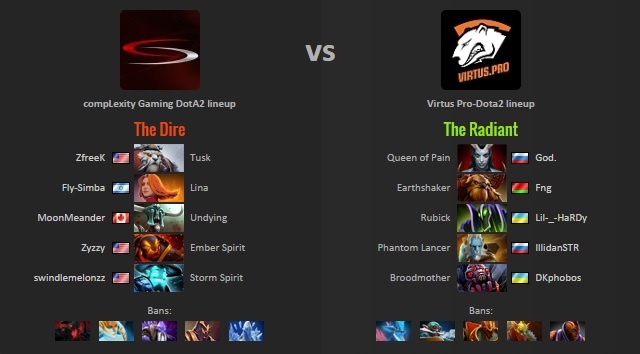 The game still swings back and fourth, VP get key kills thanks to their Siren Sleep setup. Around 48 minutes in the game, Anti Mage and Dark Seer have same net worth for some reason; coL tries to contest Roshan and gets wiped becuase of the double global silence, Vaccum into Wall, Echo Slam and the Siren Sleep. VP runs down mid and wipe coL once again, leading to the 'gg' call. 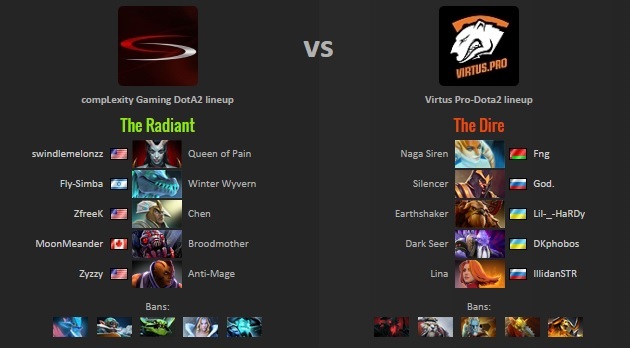 Virtus.Pro's Phantom Lancer pick secured them the late game therefore Complexity had to snowball really hard and they did have the lineup to do so but nothing went their way. Nothing much happened at the start of the game but VP still had the top three net worth heroes. The CIS team drew first blood in the mid lane by taking down the Storm Spirit; VP didn't force kills and got kills as the oppurtunities presented themselves and started dominating. coL got their first kill on the Broodmother around the ten minute mark, when the score was 3-1. VP didn't give away any kills and kept on taking favorable engagements for around ten minutes, leading to a 10-1 score at 20 minutes. The fng led team was well ahead at this point and were dominating the net worth charts. The Broodmother even dove the tier three tower to kill off the Ember Spirit. At this point, VP are up 25k gold but they get complacent and coL takes full advantage. They kill three heroes in three different lanes leading to a 5k gold swing. They get a lot of pickoffs but to no avail since VP were just too far ahead. The Phantom Lancer takes Roshan and VP push down middle lane, wipe the floor with Complexity Gaming and force out the gg call after taking three lanes of barracks.